I do not have time to review here everything that has been published on the question of whether biological evolution (as understood by those who accept the notion, namely universal descent from a common ancestor) actually happened. Instead I will concentrate on what I found to be the compelling arguments for and against it. I grew up in a Bible-believing Christian family, but despite my parents' best efforts I was exposed to a high-school teacher who promoted the idea of evolution without disclosing its problems, and I bought into it. I received a logical, scientific, mathematical education, and scientists believed in common descent, so it must be true. That, Ladies and Gentlemen, is the strongest argument I have ever seen for biological evolution: "All the scientists believe it." Twenty years later, in grad school, my thesis advisor invited me to take another look at the evidence supporting evolution versus fiat creation. I noticed a curious phenomenon: nobody had any evidence of their own; they always pointed to some other discipline as compelling. Ask a paleontologist how he knows how old these fossils are, and he tells you it's from the rock strata; ask a geologist how he knows how old the rock strata are, and he tells you it's from the fossils. Really. Yes, they have radiometric dating, but radiometric dates are all over the map, so they calibrate them from the fossils. Really. Check it out. What evidence in your own area of expertise supports the common-descent evolution model over fiat creation? In 40 years, not one qualified person has ever even attempted an answer! One person with only a Masters degree offered the observation that there is only one species of Cretacious fossil cypress tree, but there are seven species today. I asked him how different that one species of Cretacious cypress was from a hybrid of the seven today -- in other words could all seven modern cypress "species" be derived from that single Cretacious parent without any evolution at work at all? He did not reply. I asked this same Question directly of a high-ranking evolutionist member of the Southwest Baptist University Biology department faculty. He did not reply. Or rather, he did reply, but declined to address the scientific question with scientific data. There's a reason for that: There is no evidence for evolution. The reason for insisting on a terminal degree in this Question was impressed on me by a grad student in entomology, which is an important (biological science) department at Kansas State University, where I taught for three years. He said that undergraduates and masters level students are not told the whole truth about the problems with evolution, but they don't keep it from the PhD students because they cannot do original (peer-reviewed) research without knowing all the facts. In my own area of expertise (my PhD is in Information Science), I can tell you for a fact that the accumulation of random chance events does not and cannot lead to greater specialization and new features; it only corrupts what gains have already been made. Otherwise, every supercomputer in the world would be busily grinding away at simulated evolution to create new software, because software is incredibly difficult to design and get correct, and supercomputer time is relatively cheap by comparison. We do have what are misleadingly called "genetic programs" that "evolve" and become better at the task for which they are programmed. This is somewhat of a misrepresentation, because these programs never evolve beyond the bounds of the task for which they are programmed, and never in ways unanticipated by their programmer. They are designed to adapt themselves in limited ways in response to known stimuli. This is not the kind of evolution that biologists tell us happened to life on earth. The November 1987 issue of Scientific American was devoted to Entropy, and all the schemes that scientists have come up with over the centuries to create a perpetual motion engine, and the technical reasons why each idea failed. Some were quite clever, like involving little trap doors to let hot molecules collect on one side only of a two-chamber box. One of the reasons it failed is that you cannot measure the temperature of the molecules without added energy. One of the interesting findings of Information Science is that the same formulas for Entropy in the energy domain apply also to the information domain. And like the failed search for perpetual motion energy sources, there cannot be any success at all in achieving "perpetual motion" information sources. Our experience in Artificial Intelligence (AI) research supports this finding. Up until the last couple decades, serious new AI research was no longer attempting to make self-intelligent learning machines, but only mimicking human intelligence in the computer. That changed with the invention of neural nets, see "The Problem with 21st Century AI". Unlike the energy domain, where the earth is not a closed system (it continuously receives energy from the sun), the earth is a closed system in the information domain. Therefore the Second Law of thermodynamics (in the information domain) applies and proves that the origin of species by biological evolution is physically impossible apart from an external information source. At any point in time (today, or 1,000,000 years ago, it doesn't matter which), all the genetic code in the world is a fixed (albeit very large) body of information; but it cannot increase in a closed system -- in fact it will tend to decrease. That means species and genera and phyla will die off (go extinct), but nothing new will come that is not merely a reshuffling of the information already there. This is a prediction from the theory, and it is supported from all the evidence. In the 150+ years since the publication of Darwin's Origin of the Species, there has not been a single documented novel feature evolved, but hundreds of species and entire genera have gone extinct, carrying into oblivion their entire genetic code. Information has been lost, but not replaced with new information. For evolution to work, the small variations that we see in organisms today -- including the various beak sizes of the finches on the Galapagos islands and the coloration of the peppered moth in England -- must continue unbounded to the creation of novel forms. It simply does not happen. When the climate changes, the finches in the Galapagos start to grow a different size of beaks, sometimes longer, sometimes shorter, but they are always still finches. Race horses have been carefully bred for speed (survival of the fittest, enforced by careful breeding) for centuries. If evolution worked, they would continue to get faster and faster, but they don't. Races are now won by hundredths of a second, because all the horses run as fast as a race horse can run. The evolution (if you can call it that) is bounded and limited to what horses were designed to do, just like the genetic programs in computer software which are limited to what the programmer designed them to do. A few years ago I found a Wikipedia article on Richard Lenski's so-called long-term evolution experiment on E.coli. They stopped evolving at around 20,000 generations, basically when they reached the edge of what E.coli are. The Wikipedia article and Lenski's own website no longer say that, because Lenski is a Darwinist and he would lose his research grants if he openly admitted that the Darwinist hypothesis was disproved by his experiment, but that's what happened. In 2010 Wiki had a graphic chart from 0 to 20,000 generations, and the curve visibly turned down between 15,000 and 20,000. That chart is gone (replaced by a chart that stops at 10,000), but Wiki archives all the text versions and this link from 2013 still clearly tells us (under the "Results" heading) about the evolution "levelling off after close to 20,000 generations." That text is gone from the current Wiki article, which goes to great lengths to claim unbounded divergence based on inferences drawn by others than Lenski himself. The chart is gone. Lenski's own website refuses to disclose any data after 10,000 generations, despite claiming to have it archived at 500-generation intervals. He's now past 50,000 generations. Lenski cannot say so (he'd lose his grant money) and the other people reporting on his work are not the primary researchers (they are working with secondary data which has been filtered), so they don't know the E.coli stopped evolving. Lenski himself began looking for other interesting results from his experiment. The grant is his income, he must use it or lose it. What about theistic evolution, the kind taught at Calvin College and (I presume) is taught at SBU? This is an interesting minority position, held (for obvious reasons) by none of the atheistic scientists out there in the secular world, and also by none of the Christian scientists committed to the authority of the Bible over all fields of human endeavor. The Bible teaches fiat creation, with no room for progressive evolution apart from explaining away some significant parts. Yes, if God wanted to, He could have used evolution as the means to do His creation, and the entropy argument above would not apply because the system is no longer closed (God would be injecting information into the system). But once you open the door to God's involvement, you also allow the prospect of asking God whether He did it that way or not; God answered that question definitively: He did not. Theistic evolution is neither good (atheistic/naturalistic) science, nor good (Biblical) theology. Its only apparent advantage is the appearance of being both good science (by agreeing with the majority atheists) and good theology (by agreeing that God was involved). I read an interview with Francis Collins, the former director of the Human Genome Project, about his BioLogos Foundation, apparently intended to convince Christians to adopt Darwinism. Collins is obviously an expert in human genetics, so I emailed BioLogos asking The Question. They took a while, but eventually some functionary (not Collins himself, who apparently is not directly involved) pointed me to their FAQ, which I had already analyzed here (with links). The only answer to The Question from Collins I could find was in the Wikipedia article on him, where he was quoted in reference to the similarity of human DNA to chimpanzee, and less so to mouse DNA. Collins is the undisputed expert on human DNA, but what does he know about chimps? Have they done a full sequencing of chimpanzee DNA, or is this merely a statistical guess? Collins didn't say. That entire quote has subsequently been removed from the Wiki article (read it here). In practice, however, evidence for bona fide homology among telomeric factors has been elusive, and, in the case of the known end-protection proteins, evolutionary relationships have been postulated largely on the basis of protein structural and functional similarity alone. However, least-squares can provide misleading and inaccurate results in theory and in practice. To correct for the shortcomings of LS, we have applied likelihood and Bayesian techniques to the superposition problem, resulting in much more accurate superpositions and analyses of the complex correlations among the atoms within macromolecules. However, according to the theory of natural selection, differences among proteins can be important for function. Thus, for a full understanding of the relationship between macromolecular function and structure, we consider it essential to explicitly incorporate the modern developments in population genetics regarding natural selection. In other words, he defines his science in terms of evolutionary theory, not the other way around. Now with such awesome (un)scientific bias, what does he do to argue for Darwinism? He gives 29+ Evidences for Macroevolution. Five of the numbered items are in the section labelled "Part 4: The Molecular Sequence Evidence" which is the only part related to his own expertise. I examined this page carefully. Remarkably, he has 52 scientific citations supporting his arguments, many of them multiple authors, not one of them from Theobald's own research. Why is that? Why can he not find a single evidence of Darwinian common descent in his own area of expertise? Why are these other 52+ scientists not writing their own polemics in favor of Darwinism? The answer is clear: there is no evidence, not in Theobald's specialty, nor anybody else's. I looked in some detail at the first item in this page close to Theobald's specialty, where he describes what he calls "Ubiquitous genes ... that all living organisms have because they perform very basic life functions." He goes on to point out that certain variations in the DNA of these genes do not affect functionality nor serve any specific purpose in their respective organisms, and then claims that similarities between these variants corresponds to similarities between the organisms in the traditional evolutionary tree. He describes in detail only one such gene, cytochrome c, of which there are an astounding 2.3 x 1093 different possible functional protein sequences, any one of which he claims would work in any living organism. He points to research showing that "cytochrome c genes from tuna (fish), pigeon (bird), horse (mammal), Drosophila fly (insect), and rat (mammal) all function in yeast that lack their own native yeast cytochrome c," and offers a "null hypothesis... that the identity of non-essential amino acids in the cytochrome c proteins from human and chimpanzee should be random with respect to one another." This is falsified by the fact that human and chimpanzee cytochrome c is identical, and "differ by ~10 amino acids from all other mammals." He reasonably offers an alternative physiological niche explanation, then demolishes that also by pointing out that "bat cytochrome c is much more similar to human cytochrome c than to hummingbird cytochrome c; porpoise cytochrome c is much more similar to human cytochrome c than to shark cytochrome c."
That struck me as a rather compelling argument -- until I started to wonder about what he was not saying. Are these dozen variants of the cytochrome c protein cherry-picked for their support of the evolutionary hypothesis, while ignoring possibly hundreds or thousands of pairs that do not support it? We don't know. Theobald did not do that research, so he may not know either. The people who did the research reported only the results that were politically correct (because contrary results are known to get research funds cut off, as Robert Gentry learned), but they were probably honest enough not to make unjustified evolutionary claims in the obscure scientific journals none of the rest of us can get access to. What about the other ubiquitous genes, do they all show the same hierarchical similarity? For that matter, Theobald offers only a numerical comparison, but did not claim that the similarities and differences between bat and human were the same similarities and differences between porpoise and human; are they? We don't know. Theobald may not know either, it's not his specialty. Theobald can honestly (perhaps ignorantly) make evolutionary claims that the actual researchers might be unwilling to on the basis of their greater expertise. This is why we need to ask the people who are actually expert in those areas. And they are not telling us. Curiously, the Institute for Creation Research mentions the same cytochrome c protein in connection with evidence against evolution. Their miniscule table gives a little more information than Theobald's anecdotal comparisons. 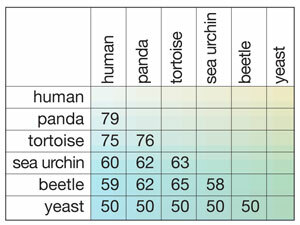 The table shows very similar differences for cytochrome b across several distinct species pairs with no obvious evolutionary hierarchy. Author Nathaniel Jeanson's specialty, unlike Theobald, is in stem cell biology, not directly involved in this issue. The only way we can know which is right is to see substantially more of the data. Neither side is supplying it (yet), and the true experts aren't telling us anything at all. Why is that? That's The Question. I looked at some of the other arguments from Theobald's 29, and the logic was so faulty as to not be worth reporting here. Postscript. I am not the only person looking at the evidence and seeing what's (not) there. Spike Psarris started as an atheist, but when he looked at the evidence honestly, the atheist dogma did not match the science. Read it here. There are from time to time reports of converts the other direction also, but they never tell us what "science" convinced them, nor if they got it from those doing (and therefore expert in) that particular science, or if it's nothing more than non-science (nonsense) reported second- or third-hand by non-experts with some other axe to grind.